Coverage: Live commentary on BBC Radio 5 live, BBC Radio Manchester, BBC Radio Merseyside, live text commentary and score updates on the BBC Sport website, highlights on BBC Two in England, Wales and Northern Ireland on Sunday, 12 October from 17:30 BST, and from 18:00 BST in Scotland. 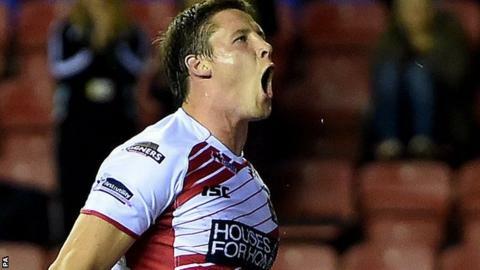 Wigan Warriors forward Joel Tomkins hopes to crown his rugby league comeback by winning the Grand Final. The 27-year-old moved back to Wigan from Saracens in June, after a three-year spell in rugby union. Tomkins has featured in six games to help the Warriors reach Old Trafford for a second consecutive year, where they will meet rivals St Helens. "It's a lot easier coming back to rugby league than it is going the other way," he told BBC Sport. "It's fantastic to be back, it does feel like I'm home now, and it would be amazing if we got the win on Saturday and top it off. "I had a good time playing union and I did enjoy myself, but this is the game I grew up playing and this is the game that I love." Tomkins returned to the Super League champions for an undisclosed fee, signing a contract to run until 2018, but his comeback was initially delayed because of a back injury. Since then, Tomkins has scored in both of the Warriors' play-off games and his form has been rewarded with a recall to the England squad. Having come through the academy at Wigan, the dual-code international is well aware of what it means to be facing their fiercest rivals in the final, and is looking forward to facing the League Leaders' Shield winners. "Both sides have really brought through a lot of local lads," continued Tomkins. "There is a real local feel to the game this year which will make it an even bigger spectacle and a real old-fashioned Wigan-Saints derby. "It adds a bit of extra spice, I suppose, with people really knowing about that rivalry because you've been brought up around it. "I think the atmosphere on Saturday will be unbelievable, like no other really. "You can't finish it off in a better way than beating Saints at Old Trafford, but we know that they feel the same as well. "I don't think it's really a hatred, it's just a competitiveness with the two towns being so close." Joel's younger brother Sam, who moved to New Zealand Warriors for a world record fee last year, has been spotted back at the DW Stadium supporting his old team-mates, as they reached the Grand Final for third time in five seasons. "He's been in and around the club a little bit. It's nice to have him back," added Tomkins. "Lee Mossop, who's in the NRL now as well, has been around the place doing a bit of training, so it's nice to see some old faces and they'll be there on Saturday cheering us on."